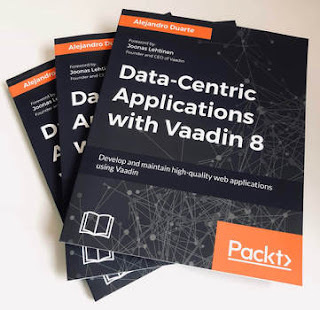 Data-Centric Applications with Vaadin 10? I recently got some hard copies of my last book about Vaadin. I love the matte colored look of the cover. Excellent job by Packt Publishing! Anyway, since the feeling of receiving a package with your own books is hard to describe with words, I decided to do it with code. Although most of the concepts and design ideas that the book covers are valid for any version of Vaadin, I created a Git branch with all the examples migrated to Vaadin 10. At this time, there are certain features that Vaadin 10 doesn't include (yet?) such as Grid editors, Menus, and LAYOUT_COMPONENT_GROUP styles. But besides that, pretty much everything was easy to migrate.